I don’t like using the oven during the summer! It is too hot and I don’t want to be around the heat of kitchen! I want to enjoy the great weather and outdoor activities with my family! Even if I don’t use the oven, there are many non-bake and easy recipes that can keep you cool and healthy! Since we have fresh produce during the summer, one of my favorite meals are the summer salad recipes! They are so refreshing, easy to make and healthy! There are endless ideas for summer salads. I like adding fruits, nuts and experimenting all sorts of combinations, some of them work, such as the Romaine, strawberry mix and some of them don’t. One day, I mixed grilled eggplants to my romaine salad. It was a nice looking summer salad recipe but the combination wasn’t that tasteful. I don’t recommend it! 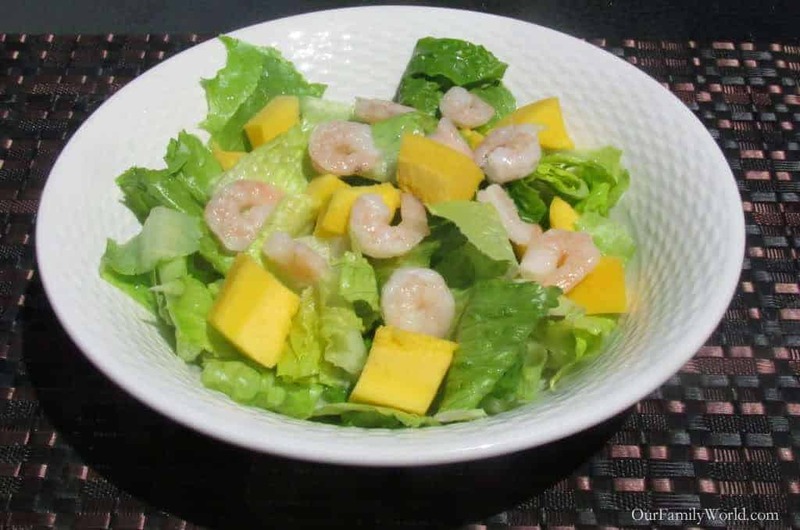 Today, I am sharing with you this delicious summer salad recipe from LifeMadedelicious: The Mango Shrimp salad recipe. I have never mixed mango into my salads. I am a huge of fan of this fruit that I can eat two mangos on the row . If you have never tried mango before, you may consider it, especially if you are a sweet tooth. This king fruit has so many nutrients: vitamin C, antioxidants! It is good for the health and tastes so good in your summer recipes. 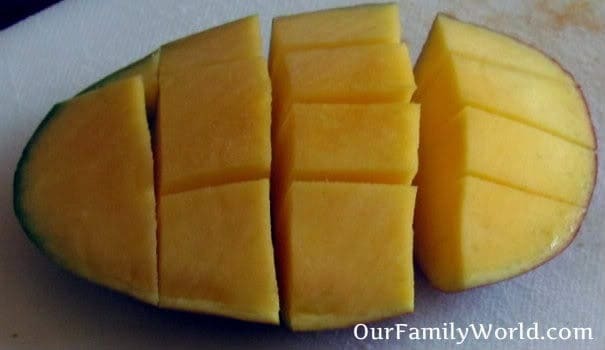 The only thing I dread about mango is how to cut it and shape it! It can be a little messy especially if it is too ripe! 1 lb cooked peeled medium shrimp, thawed if frozen, tail shells removed. 1 ripe medium mango, seed removed, peeled and cubed (1 cup). You can used frozen mango but I prefer fresh one. In a large bowl, mix salad greens, shrimp, mango and pea pods. Pour dressing over salad; toss gently to coat. It was delicious! Summer salad recipes are easy to prepare, quick, refreshing and non-bake! Enjoy! Mango, shrimp…I’m dreaming of summer! Oooh I bet a nice cheese added into the salad might spice it up… there could be so many yummy variations! This looks like the perfect summer BBQ side dish/appie. I hear you on not wanting to use the oven! I love Mango and put it on everything (buy it by the case). Never thought to mix it with shrimp (which I also love). Thanks for the idea! Looks perfect for summer. A great way to use mango! I don’t think I’d have thought to put mango and shrimp together!! Oh my goodness! That sounds so good! Two of my faves: Shrimp and Mango! I love salads in the Summer! So refreshing! Bookmarking this recipe! Thanks Christine! This recipe is so refreshing and so easy! Looks yummy I have been trying to find new recipes with shrimp, I’ve been on a shrimp craving lately. I’ll have to give this a try. I don’t like cooking when it is hot too!